As mentioned on the previous page, our exploratory drilling had revealed the existence of a 3rd chamber and it approximate location. 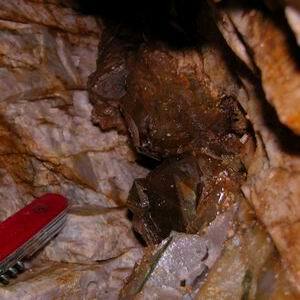 We had also noticed tubes at the back and to the right of the first chamber and the upper left of the 2nd. These ,we suspected, led into the 3rd. After we had enlarged chamber 1 by careful blasting of the roof ,we were better able to investigate it's tube. 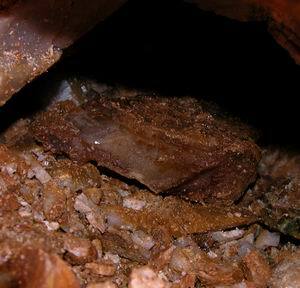 Prior to blasting and chipping, a smoky quartz crystal with a pink quartz ring nearly blocked our view into the tube. The fact that we had to squirm up into the chamber and then turn on our left side to examine the space was not helping either but finally we were able to get a decent look. This tube did lead directly into a 3rd space. Using a nylon bar we could measure it to be at least 3 feet long. 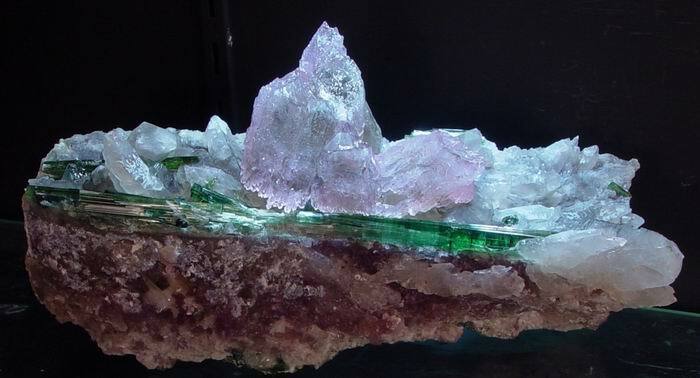 ( In the Jim Nizamoff photo at the right the smoky quartz has finally been dislodged from it's attachment and the tube widened slightly. The smoky rests at the tip of the chisel. ) We were now able to work some of the new space. It was cramped and unpleasant digging and it would eventually require another small blast to open the space further. Even so, some nice pieces were retrieved. The next day, the 23rd of September, we came back to continue working chamber 3. We again did a small blast in the right side of chamber 1 in order to better access 3. 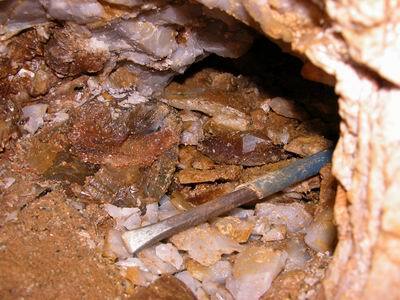 This shot worked fairly well and, once the many quartz and feldspar shards were cleared out of the way, the digging resumed. 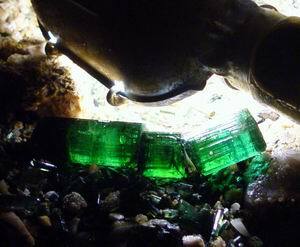 In the photo to the right we have used a garden hose to wash away some of the loose pocket debris at the front of the chamber exposing a decent tourmaline. A drop light provides illumination through the crystal. 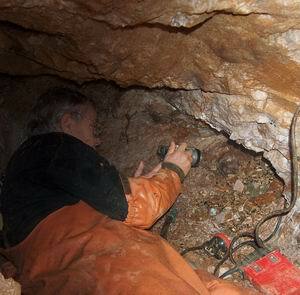 Richard, Mary and I took turns crawling in and trying to find the killer piece in this chamber. As we excavated to the rear, the top layer of the space was covered in milky quartz plates that had some point through the eons shelled off of roof and landed on the top of the pocket material. Next were many smoky quartz crystal plates some with pink quartz. 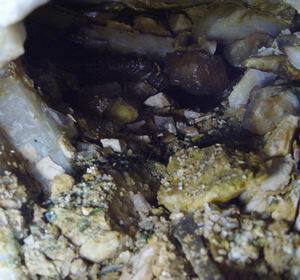 Below this there was a layer of lepidolite plates with attached quartz crystals and tourmalines (see image to the left). 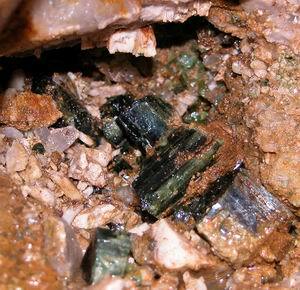 Beneath all of this was a layer of cookeite with many small tourmaline sections. The premier piece from this chamber and in fact all of pocket 21-06's 3 chambers was a specimen that incorporated all of these elements. 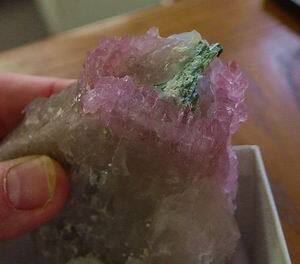 I was working at the back of the chamber when I pried up a lepidolite plate. Thinking it of no special interest ,I set it to one side without a second glance. As my person almost entirely filled the space passing out material required placing it on my back and then calling out for someone on the outside to retrieve it. It was impossible to turn to hand anything directly out. I did not think this piece warranted the contortion necessary to place it on my back. There was just about enough room to turn one's head from side to side and paw a little with arms out stretched. 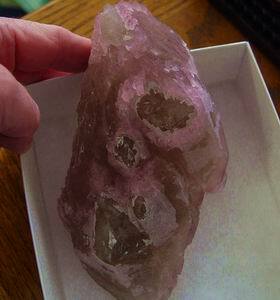 I happened to turn toward the cast aside plate, when I my eye caught the pink quartz protruding from the lepidolite. 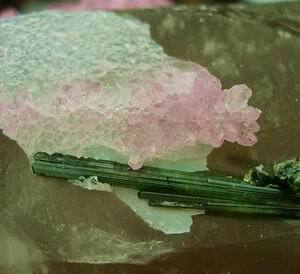 Next my gaze locked on to the long green gemmy tourmaline running the length of the plate. Like a centipede thrown into reverse, I hit the gas and wiggled out of the hole taking the find with me. We couldn't believe our eyes. 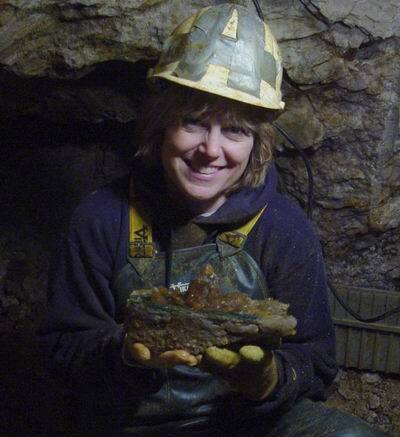 In the image Mary holds the specimen now called the 'Yorktown'. The piece has a striking resemblance to an aircraft carrier... pink quartz bridge, tourmaline rails, smoky quartz deck and a lepidolite hull. I chose the name 'Yorktown' remembering the pivotal role the ship played at the battle of Midway... and now Maine's battle for it's place on the world stage of mineral localities. A view to the back of chamber 3. 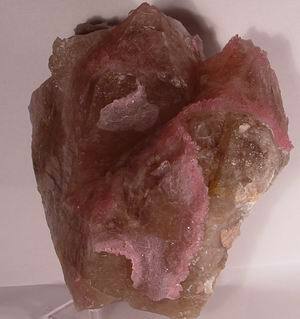 A 30 cm smoky quartz group heavily overgrown by pink quartz. We spent the next 10 days working 21-06 before doing another burn with hopes of more discoveries. 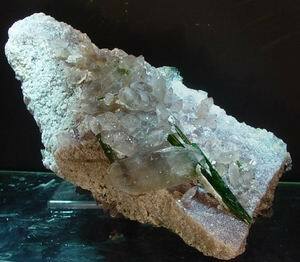 We were fascinated by the huge microcline feldspars we had encountered and wondered what they portended.